Oi everyone, how’s it going. 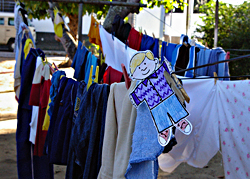 Flat Stanley here, sending you another e-mail from Brazil. Do you like getting my messages? I hope so. I’m having a lot of fun finding neat things to talk about. 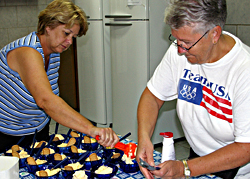 Last night, my friends Debbie, Janna and Kaylea put together an “ice cream party” for the boys at the orphanage. We found some vanilla ice cream or vanilla sorvetes at the Hiper Mart. Guess what, Hiper Mart is owned by Wal-Mart. So shopping there was a bit like being at home, but of course, all of the signs were in Portuguese. Anyway, we dished up the ice cream so everyone got a scoop of vanilla, strawberry topping and a cookie. They loved it. 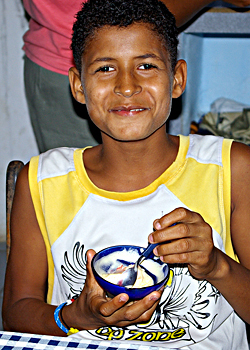 By the time we served it, some of the first bowls were a bit melty, but the boys didn’t care, getting to have sorvete is a HUGE treat. It sure looked good after they finished their supper, cold potatoes and scrambled eggs. This morning, I got up at 6 a.m. (because the sun comes up at 4:30 a.m.) and found some of my new friends doing their morning chores. Do you have chores? What do you do before breakfast? My friends were washing their clothes. I’m sending a couple of pictures from this, so you can see what I mean. 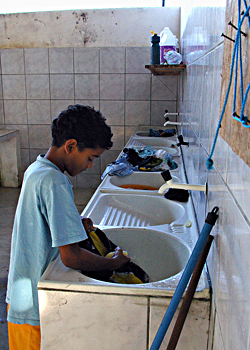 They weren’t using a washing machine, instead they hand-wash everything using a bar of soap. One of their sinks looks like an old fashioned wash board, with ridges built into the bowl. They scrub their clothes using that sink, then rinse them out in the regular sink. Then they hang their clothes out to dry on lines in the back yard. Do you do your own laundry? What do you think about washing your clothes before breakfast? I even got to help one friend hang his clothes up. Well, that’s all for now. I’ll write another letter describing my trip to the Hiper Mart.